One question we get asked quite often is how do I create a slackline for the back garden, because I don’t have any trees? The provision of an outdoor setup is actually pretty simple and goes something like this…. •	Dig two trenches, 1m deep x 1m long, one at each end of where your line will be. Each trench should run 90º to the direction of your slackline. 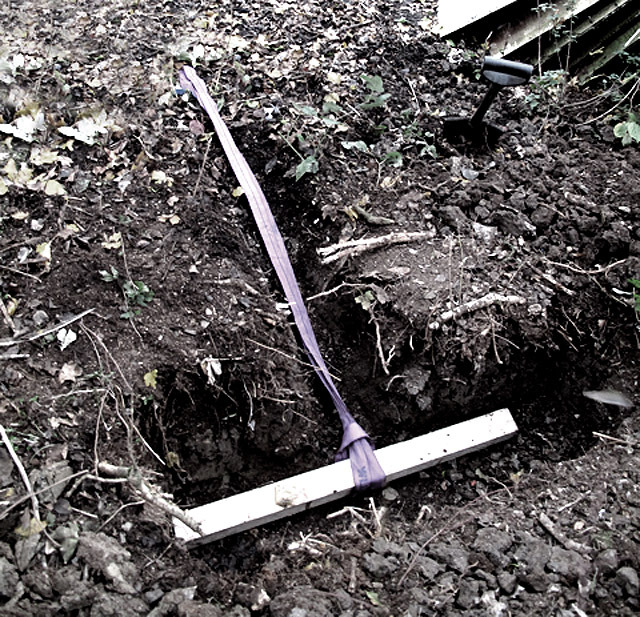 The end of your slackline will be aimed at the middle of your trench (50cm from each end!). •	Dig two more trenches, each one running from the bottom of each of your first trenches (50cm from each end! ), and running at a 45º angle towards the surface and the ends of your slackline. If you get the angle right and the depth of your first trench, this trench should end (reach the surface) 2m from your first trench. •	Cut your 2m of timber into two 1m lengths. •	Choke one spanset around the middle of each length of timber. •	Place each ‘dead-man’ into each trench with the spansets running up your 45º trench towards the ends of your slackline. Stamp the ‘dead-man’ firmly into it’s grave! •	Fill in the trenches a little bit at a time, making sure you stamp it down as you go. •	Attach each end of your slackline to each spanset using a shackle (1 tonne min.). Do not choke your slackline to the spanset as this reduces the strength of the line and the spanset, and causes friction between them. •	Place an A-frame under your slackline to raise it to the required height. Make sure it is placed an appropriate distance from the ‘dead-man’. Eg. : If your A-frame is 1m high, place it 2m from where your spanset reaches the surface. This will ensure you are pulling the timber against the ‘dead’ ground, and not upwards and outwards! We currently have slackline clubs running in Poole, Brighton and the Nottingham area. It looks amazing and i will be coming down to the Outdoor Show to give it a try please! Question, in the video you are indoors, what are you using as anchors as I would love to set this up in my studio.